It's nearly two weeks now since our baby girl arrived and life is starting to take on a sort of schedule, albeit not a very productive one. Sleep is definitely interrupted, so our mornings are pretty much a loss. The day doesn't really start for us until about noon (when we're all finally conscious, dressed & fed). I'm going to attempt to start our first week of the new homeschool year on Monday, but it's 50/50 whether we'll be able to pull it off or be a bit part-time for a while. Besides the challenge of adding in a new baby, our 3.5yr old will be home instead of in preschool this year. I have some lesson plans to help stay organized, but I'm hoping to still have themes to keep things interesting for us all. When we first started homeschooling and just used lesson plans, it began to feel chore-like after a while and more about checking things off than enjoying learning. I decided to ease into our new routine the past week by using some great ideas from Carisa at Tot School. 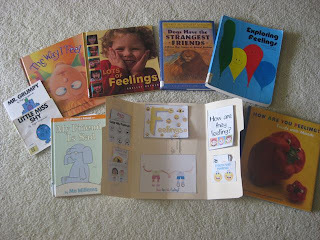 I made the Feelings Tot Book and got a bunch of great books & dvds on the topic from our local library. Both my guys (ages 3 & 6) loved doing the activities in the lap book. Declan has been carrying around the emotion faces every morning now and saying what each expression means as he looks them over. We had him recognize and read the letters on the ones with words and then have Ethan read each word to him. They enjoyed hearing the Mo Willems Piggie & Elephant books, as well as the Mr. & Little Miss ones (that I loved as a kid too) and Ethan read a few of the other books to us for practice. I tried to have a good mix of items that showed emotions in real people, animals and pretend characters, so they could recognize feelings in various settings. My personal favorite was How Are You Peeling? by Saxton Freymann, because it is so darn cute & accurate in showing expressions on real fruits & vegetables. We also spent a lot of time talking about what feelings we experience and what makes us feel that way and how our baby expresses her feelings since she can't tell us what's going on. The guys also spent a lot of time playing together and working on sharing, listening to each other and resolving disputes. I think it was a success, so I'm hopeful the next week will go well. Thanks for visiting! Uh, yeah, my tip on homeschooling with littler ones in the house is preschool. HAHA! Really, it depends on everyone's personality and learning style. My kids are particularly jealous when one gets individual attention and they are always more curious about what ever the other kids are doing than they are about the work in front of them. Plus, I'm not the most organized person and I get little to no time to do pre-planning, and when I do, well, it requires that I be organized! I'm working on it though - and so is my husband. 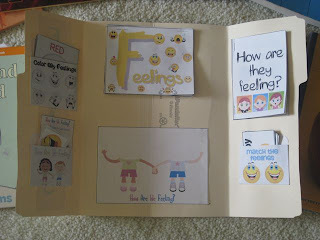 What a great idea to start off school with talking about feelings! I love that lapbook and plan to make it sometime soon. I can't believe all you are doing with a brand new baby too - it's amazing. I hope it all goes well for you!! Feelings are such an important part of every days lives so what a great theme to work on!!! :) Hoping your life settles in quickly with the baby! I'm in awe - firstly of anyone who homeschools, but especially of someone who homeschools with a wee baby about.